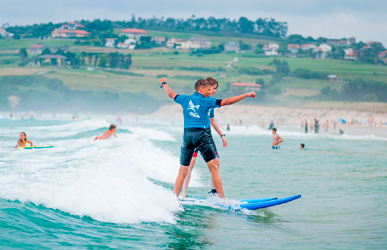 Surf courses in North Spain are taught in small groups of up to eight people by qualified surf instructors in order to correct each mistake individually. Surf instructors will try to correct every single mistake you have, offering the possibility of wanting to learn and improving in the most correct and quickest way. Surfcamp has different surfboards to suit you. Variety of sizes and shapes to offer you the most suitable surf board. Furthermore we offer you excellent wetsuits to beware of getting cold after long hours in the water. Surfcourses are starting on Sundays until Fridays. On Saturdays, surf lessons aren't possible due to surfcamp staff will be busy with the arrivals and departures. The Beginner Surf Course consists of 12 lessons every week. The aim is to make you enjoy standing on a board as soon as possible. The Intermediate Surf Course consists of 12 lessons every week. The aim is to make you catch the green waves (unbroken waves), start surfing their face and maybe even do your first turns. As the courses are given in small groups you will benefit from individual treatment and correction in order to achieve your goals. The Advanced Surf Course consists of 12 lessons every week. This course is mainly focused on people surfing almost every wave’s face side wards, willing to correct this and starting their first turns. You should feel comfortable in wave’s in-between 1-1.5 meters. The aim of the course will be agreed with the surf teacher at the beginning of the first lesson.